No visitor to the Laotian capital Vientiane should leave without visiting Pha That Luang, the 45 metre tall golden stupa four miles from the city centre. Only half the height of Rangoon’s early medieval Shwedagon Pagoda, That Luang is also much younger, being a modern reconstruction of the heavily damaged original. 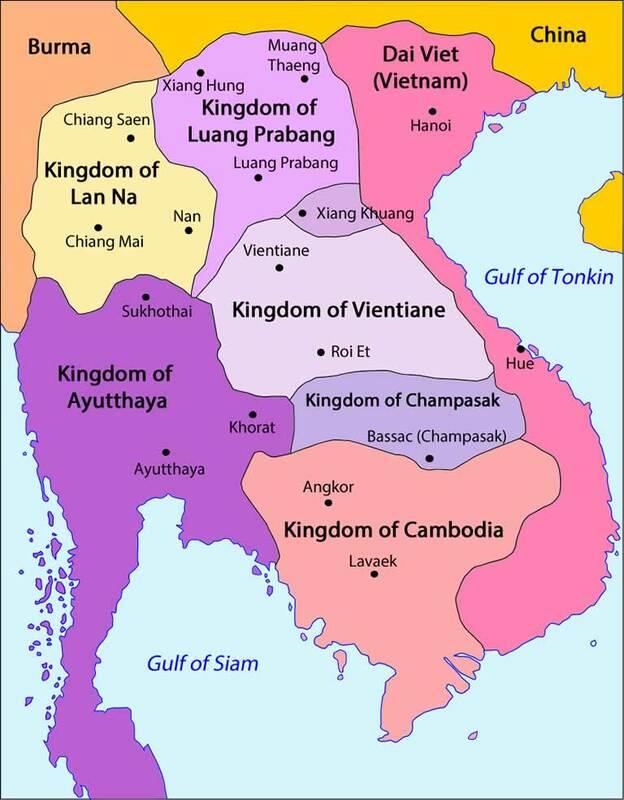 That was ordered by King Saysetthathirath in 1566 to mark the establishment of Vientiane as the Lao capital, and was said to contain the breastbone of the Lord Buddha. Reconstruction or not, this triple-layered symbolic mountain, gleaming gold and surrounded by a battlement of mini-stupas is a striking and distinctive icon of Laos’s ancient nationhood and Buddhist piety. It has been impressing Western travellers for over 370 years. Pha That Luang stands out all the more because landlocked Laos (population 6.7m) lacks a critical mass of relics of its ancient eminence. With no legacy akin to that of the brick and stone-crazy kings who ordered Angkor, Pagan and Ayuttaya, it’s easy to assume that Laos was always a backwater, whose mellow agrarian culture never rose to great heights. Easy but wrong. This fertile country, which beats Burma and Cambodia in the regional prosperity league, always had a rich material culture. But its ancient palaces and temples were made of wood and easily razed over the centuries by the marauding Burmese, Siamese, Vietnamese and Chinese armies. Pha That Luang had its symbolic heyday in the 17th century during in the 55-year reign of the country’s greatest king Sourigna Vongsa (r.1638-1695). In the century after the defeat of the over-extended Burma-based Toungoo Empire, Sourigna was the military strongman who held together the fractious micro-states of Luang Prabang, Vientiene and Tran Ninh in what was a golden age of the state of Lan Xang, the old name for Laos. He established peace with aggressive neighbouring empires and turned Laos into a hotbed of trade and learning, “a Buddhist arcadia” according to the great Southeast Asian historian DGE Hall. Monks and nuns travelled there for religious study from throughout Southeast Asia and literature, art, music, and court dance flourished. “Sourigna Vongsa’s firm and just rule gave his kingdom a reputation for strength which was sufficient to deter any would-be aggressor from risking an attack upon it”. Much of what we know about Laos’s moment in the sun is thanks to a Dutch East India company functionary called Geeraerd Van Wuysthoff, who left the first record of an expedition up the Mekong river. He led an expedition up the river, far more arduous than pampered Pandaw passengers can imagine, that climaxed at Pha That Luang in November 1641. This was the backdrop chosen by the King to receive the first Westerner ever to visit “the kingdom of the million elephants”. Van Wuysthoff’s four-month journey from Phnom Penh to Vientiene from July 1641, one of the most detailed early explorations of the river, was bad enough to deter anyone from ever attempting to retrace his steps. Like the mountains and the jungle, the Mekong did its part to keep Laos foreigner-free until the later 19th Century, as his descriptions of the natural hazards like the Khemmerat Rapids put paid to any commercial hopes about the river being a regional highway. White faces were no big deal in much of 17th Century Southeast Asia, but they certainly were in remote Laos, a country almost unknown in Europe. Van Wuysthoff was a commercial mission, bearing a letter from the Governor General of the Dutch East Indies Anthony Van Diemen, intended to secure Laotian supplies of gumlac and bezoin, natural resins with multiple industrial applications. It is almost impossible to imagine in the current age the extreme strangeness of this inter-cultural encounter, more akin to an alien landing than a trade mission. 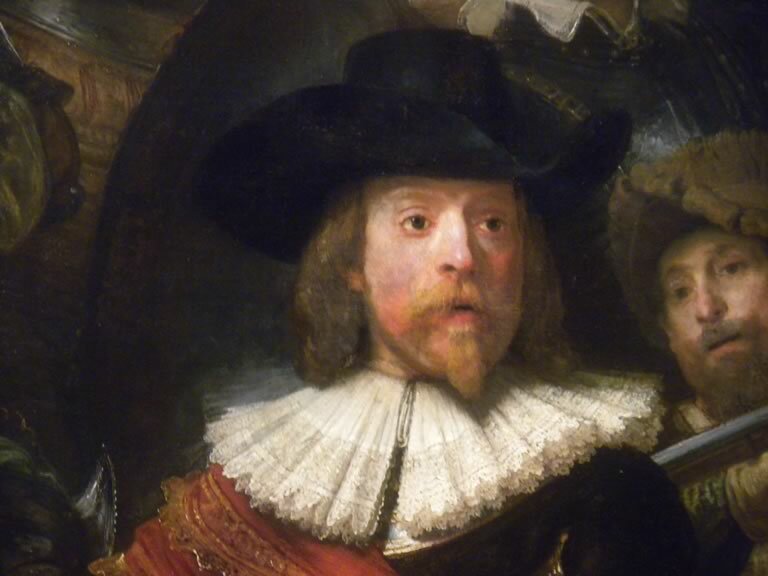 This being the age of Rembrandt, we can imagine Van Wuysthoff, and his two Dutch assistants (they also brought two servants and a barber), presumably in their Night Watch-style Sunday best (ruffs, floppy hats and silk cummerbunds), with Pha That Luang a gleaming backdrop, kowtowing before the 20-something generalissimo, Luckily they took notes. The King arrived mounted on a white elephant, with three hundred foot soldiers and a contingency of war elephants with armed riders and a troupe of musicians. Following them was another contingent of 200 soldiers, 16 more elephants some bearing the King’s five wives and their attendants. After cordial talks, in which the King politely ruminated on the prospect of receiving and reciprocating further missions, the Dutch were treated to a characteristically welcoming Lao entertainment, this one including boxing, wrestling, fencing, fireworks and dancing. Before returning to Cambodia in late December 1641, Van Wuysthoff, a spy as well as a merchant, amassed useful political intelligence about the caravan routes to Siam, about the country’s frosty international relations, and about its complex governing system before making journeying back down the Mekong river. It was a golden age for music, architecture, sculpture, painting, gold and silver work, basket work and weaving , all of which are appreciated by Pandaw passengers to this day. Just after van Wuysthoff’s visit, the Jesuits, who were then all over Southeast Asia penetrated this landlocked virgin territory in the interior, where they were tolerated by the Buddhist clergy for five years, during which they failed to convert the King, and failed to gain a lasting foothold for the Church. So what followed from these daring probes into the mysterious interor? Not much. With Sourigna Vongsa’s death the country returned to the factional bloodletting and regional rivalries that were the norm. The king’s own son might have made a difference, but he was executed for seducing the wife of the chief of the corps of royal pages. Sourigna Vosa could have intervened to save his son’s life, but, stickler for law and order that he was, declined to do so. That was it in terms of Western contacts with Laos for the next two hundred years, until Henri Mouhot, the great French explorer and “discoverer” of Angkor arrived in Luang Prabang on bullock cart. His account of the country was published posthumously as he died of a fever there in 1861 and is buried near the Nham Khan river, a short tuk-tuk drive from Luang Prabang. By that time the French were eyeing up Laos as a buffer extension of their Indochinese empire against British-influenced Siam, eventually turning it into a “protectorate” in 1893. I asked the Laotian Embassy in London if there were any known images of Sourigna Vosa, but apparently none exist, even in the form of a modern idealised statue. To get a glimpse of Laos’ glory days requires a visit to Pha That Luang and a good imagination.